Documentary examining the couple who saved the monarchy from disaster. Queen Mary always put duty first, but after King George's death in 1936, she took centre stage. 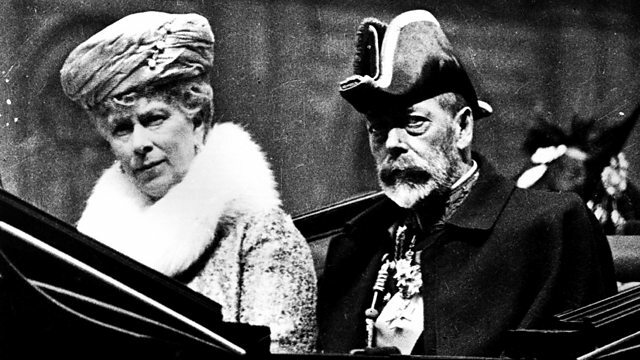 A two-part portrait of Elizabeth II's grandparents, King George V and Queen Mary, which examines the lasting legacy of the couple who rescued the monarchy from potential disaster, and whose influence persists to this day. Episode two focuses on Queen Mary, who came from a relatively humble royal background, but was picked as a future queen consort by Queen Victoria. At first she was betrothed to Prince Eddy, heir to the throne. But when Eddy died she was unceremoniously passed to his brother George. Despite the arranged marriage, King George and Queen Mary had a loving relationship. Mary revered the monarchy and obeyed her husband in all things - even the length of her dresses. She always put duty and service first. But when King George died in 1936, this once rigidly formal character emerged as a determined if eccentric royal matriarch with a mind of her own. When the abdication crisis threatened the future of the House of Windsor, she was the rock to which the nation turned as a symbol of stability and continuity. Queen Mary died in 1953, having lived to see her granddaughter Elizabeth ascend to the throne.